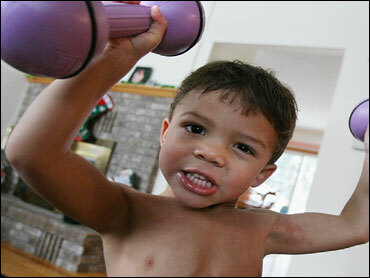 A three-year-old Michigan boy is super-strong. He can move furniture, hold five-pound weights, and do sit-ups with ease. But Liam Hoekstra, of Roosevelt Park, appears to have a rare genetic condition -- one that presents special challenges to him and his parents, Early Show Medical Correspondent Dr. Jennifer Ashton said Thursday. Ironically, learning more about it could lead to treatments for other muscle afflictions, researchers say. Liam likely has a condition called myostatin-related muscle hypertrophy, which means his body has very little fat and enlarged muscle fibers that make him really strong, Ashton says. The first human case was documented in 2000 in a German boy. As a toddler, Liam had very defined muscles, but now he doesn't look much different from any other normal child his age. He's actually a bit smaller, but much stronger, Ashton points out. It was first believed that since the heart is a muscle, it could be affected by this condition. But we know now that's not the case, she says. Because of his fast metabolism, Liam needs to eats constantly, as many as six meals a day to avoid a caloric deficit. And, Ashton has been told, because he's so strong -- he falls, for instance, without getting hurt -- Liam's not learning the appropriate fear judgment of a child testing his or her limits. To learn much more about him, see many photos, and watch video of him, click here.